Samsung front loader washers use approximately 13 gallons of water per cycle and our top loaders only use approximately 18 - 23 gallons per cycle. Samsung washing machines use such small amounts of water pushing water through the laundry, instead of pushing the laundry through the water. Note: If there is not enough water supplied to the unit, an "nF" error message will be displayed. Power off the unit and verify the water supply valves are opened up all the way. Also verify they water supply hoses are not kinked. Please see the related content to the right for additional information. 1. Empty the washing machine completely. 2. Turn the washer on and select a normal cycle. 3. Then press the the Start/Pause button. 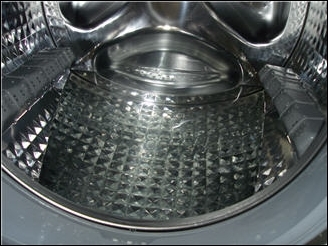 The washer will partially fill with water and the drum will rotate during the initial fill. Once the initial fill is complete, the wash portion of the cycle will begin and the tub will fill will more water. 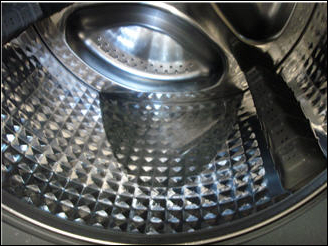 At this time, the water in your washer should be about the same amount as the image below.